There was rain, there was thunder and lightning and squally wind. 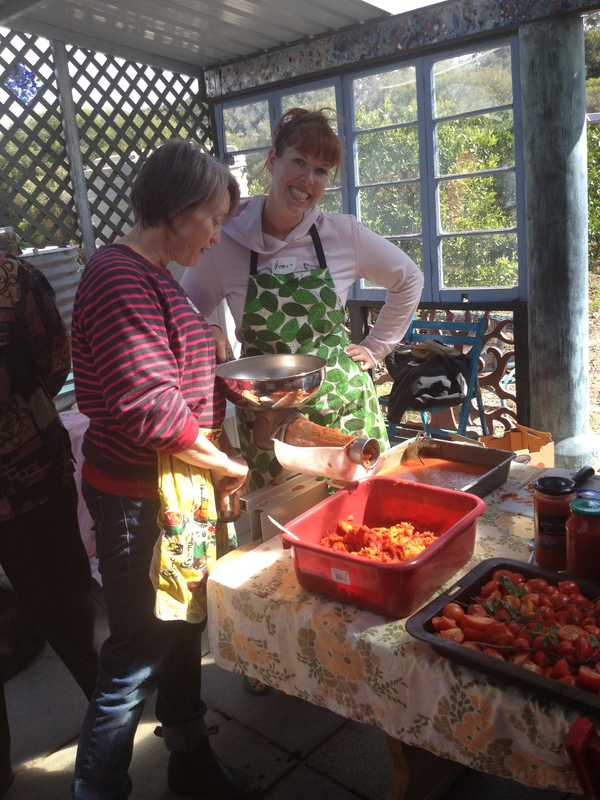 It was a dose of winter at the end of Spring, and it was NOT going to stop the Kitchen Gardeners holding their Preserving the Harvest workshop. The plan had been to make marmalade, lemon curd, lemon cordial, tomato passata and Moroccan preserved lemons. Well, four out of five is pretty good. 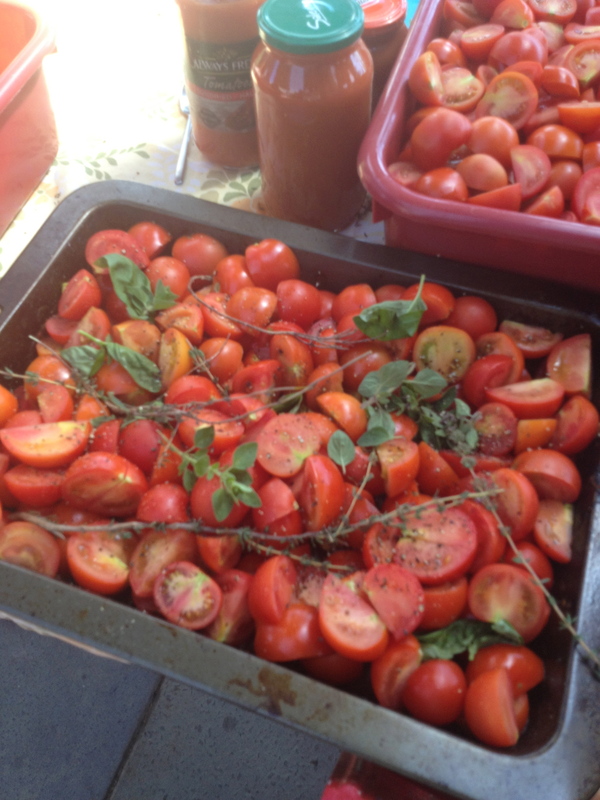 We managed to process something like 30kg of tomatoes into passata, flavoured with garlic, thyme and oregano. We also made up a dozen or so jars of Debra’s microwave lemon curd (recipe at the end) and two batches of marmalade using Elizabeth’s Great-Nana’s guaranteed recipe (recipe also following). Debra also made just enough lemon cordial for us all to try. Microwave @ 50% power for 10-12 minutes, stirring well after each minute until the mixture thickens. Bottle in clean glass jars & store in fridge. Use within 3 weeks. *can be cooked on the stove using a double boiler on medium heat, stirring regularly to avoid curdling. REMEMBER TO STORE IN FRIDGE! Slice citrus finely and remove pips. Put fruit and water into your jam pot and simmer until the fruit is soft – this is important as once you put the sugar in, no further cooking occurs. If you don’t get the fruit really soft first up, your marmalade will be impossible to chew. Put your jars and lids into a 120deg C oven to sterilise them. It’s important that your jam goes into hot jars – hot jam into cold jars is likely to end in an explosion. Once the fruit is soft, add sugar and boil to setting point. To check setting point, put a dribble of marmalade on a saucer you’ve had in the freezer for 10 minutes. Marmalade at setting point will crinkle when you push your finger through it. Leave the marmalade to sit for 10 minutes. This is also important – slightly cooled marmalade will mean your fruit is evenly distributed in the jar, rather than floating on the top. Pour into sterilised jars, seal and label. 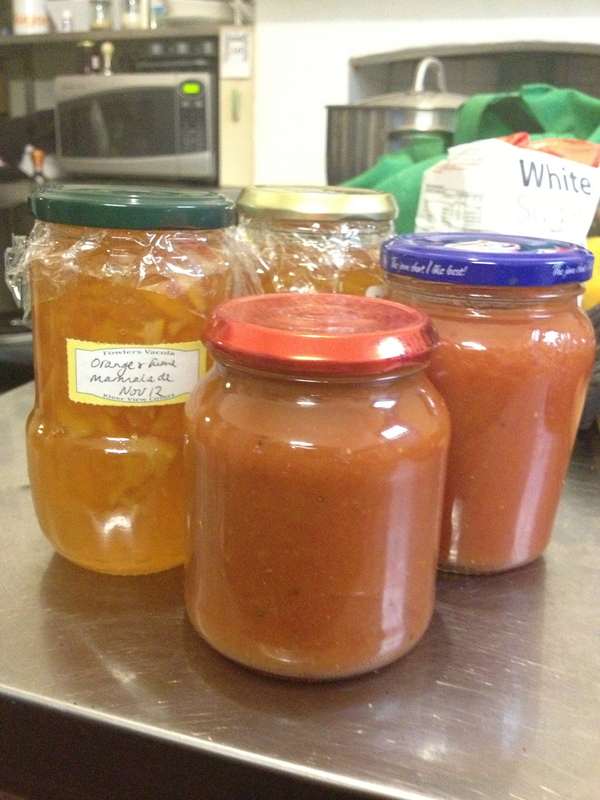 We are planning on having another preserving workshop in February 2013, but in the meantime – Happy preserving! This entry was posted in Event, Food, Take Action and tagged Cooking, Kitchen Gardeners, Lemon curd, Marmalade, Preserving the harvest, Tomatoes. Bookmark the permalink.